Happy Friday all. Big full moon tomorrow – I plan to hang on firmly to my sense of the ridiculous, & keep it light & good. In the meantime, wherever you are, I hope you can get outside and roll around in Autumn. 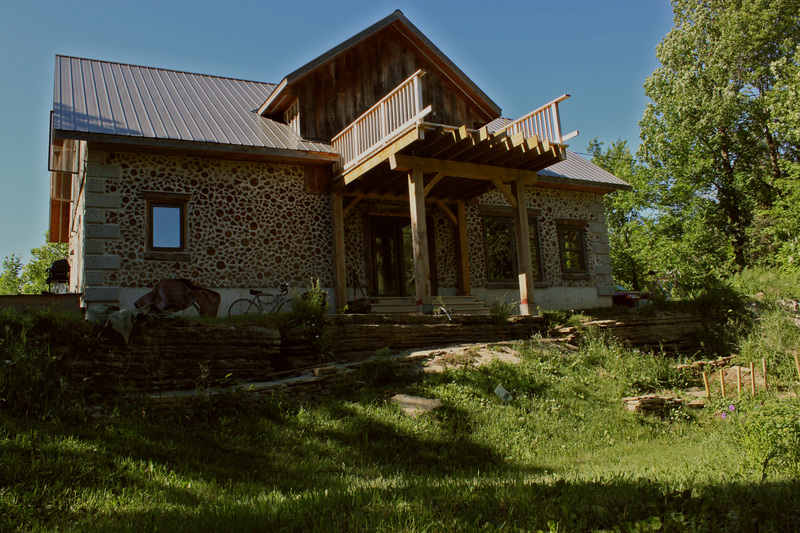 Categories: The cordwood house- 2006-2013 | Tags: Autumn, breathing, get outside, happy friday, outdoors, restorative, sunlight, take a walk., trees | Permalink. 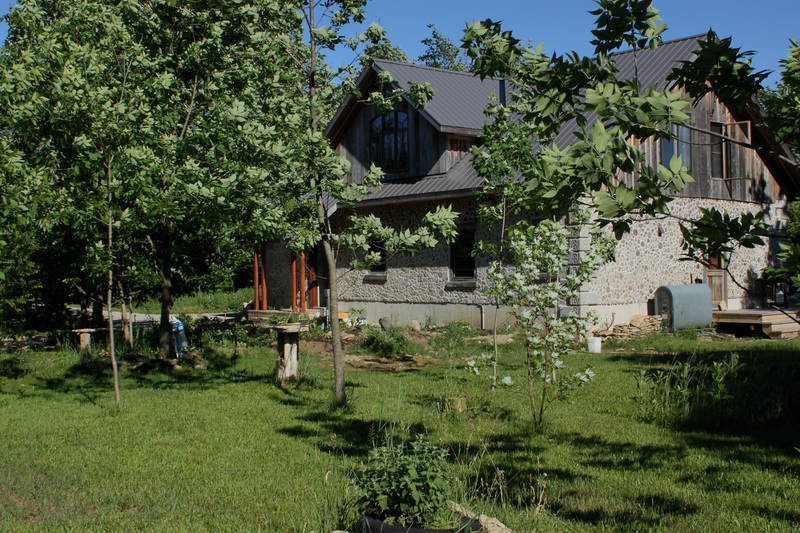 Our house sits on bedrock beside a small old quarry. We and the quarry are surrounded by big old trees and growing young trees, so summer mornings are full of birdsong echoing off the high ceilings through open windows. It can be cacophonous – I often feel like I’m working in a jungle tree-house up here at my desk. In mid September the orioles are gone and the robins, and many of the other highly vocal summer guys who need to be far away elsewhere come frost, so the starlings can reclaim the trees. They’re out there in force this morning – summarizing the past seven months, discussing the route south, setting up the hierarchy for next spring, commenting on what they saw yesterday and last week. I hear loons, cats, robins, sparrows, bobolinks & raccoon babies & squealing children in their chatter – they possess a phenomenally vast & comic vocabulary. How can people dislike starlings? …. morning tasks are done, sun has risen to midpoint. Starlings are off at work somewhere – likely practising that one-mind-twothousand-bird flock thing they do. I shall harvest tomatoes, clear the floors, rescue the pump, and attend to my own work here, while the crickets sing their high-frequency song. I won’t forget to look up. Categories: Music, The cordwood house- 2006-2013 | Tags: changing season, chatter, crickets, get it done, go to work, listen, look up, morning, notice, September, trees, vocabulary | Permalink. …trees like green walls out every window, on every floor. This happened suddenly, when the ash leaves opened – about 3 weeks ago. Now the air tastes still and green and humid-heavy, builds in a dark blustering crash to thundering rain on our metal roof, then abates and burns with full sun again. Even the cats run outside for a shower, then come in to melt on the slate floor when the heat returns. I’m at my studio now, fan at my back pulling air in from the open window, and throwing it (warm, even), at my skin. It’s dark, even at 8pm with the sun still full outside – I dare not turn on the studio halogens for fear of broiling my mind into stupidity. The light table also will be impossibly hot. So I write. The light of the day will be gone in an hour, and by its reflection I can see my shovel and my axe paintings on the far wall, emerging nicely into what they will become. These two paintings are like backward-method sculptures as they develop, very interesting to me. It’s as though the illusion of depth is growing around the image, so they appear and disappear, then appear again. Painting is additive and sculpture subtractive, but I imagine the process of listening and responding to what’s happening to the piece is the same. Pics soon for this studio stuff. My camera’s in the (hot) car, and I don’t want to go down and get it. I’ll add them here & re-post. In addition to the visual depth that is increasingly apparent, there is history and personality embedded in them. The stretched canvases they’re on have been active tools in my cello teaching these past six months or more. When things get too intense in a lesson (always there are many ways around a physical or psychological obstacle to success!) my students put down their instruments and draw big swooping lines there – anger, fear, frustration, release, joy, growth. So Shovel and Axe will forever be twinned in music as well as in earth and wood. Full credit to my students – those are some incredibly communicative lines – full of energy. This cello student participation behooves me to write and record a cello/ voice soundtrack to go with the installation of these pieces. Hopefully my students can add their voices to it. Oh – and there will be a pitchfork too. A couple of hammers. A clamp, a crowbar, and a wrench. A scythe. Each of these tools is incredibly, impossibly old – some prehistoric, in their usefulness, at least. Each one is a work of imagination and engineering – the more I dig into the research, the more enamoured I am. Categories: Art, Music, The cordwood house- 2006-2013 | Tags: ash, cats, cello, dark, Garden, happy to be back., heat, house, imagine, leaves, lightning, rain, shower, studio, teaching, thunder, tools, trees, voice, wind | Permalink.